One of the greatest sciences today is that of medicine and it doesn’t matter what season of the year, the body might need it to help cure the cause and symptoms of illness. During the winter months a lot of us head of to our pharmacist in order to buy medication to relieve the symptoms of colds and flu. The summer months have their fair share of health problems as well with various allergies being amongst the main culprits. Indeed, we use medication for a variety of conditions. We take our medication in order to operate more efficiently, after all, most of us have to work for a living and have errands to run. Driving enables us to get to the places where we need to be. However, how many of us have given thought to the fact that the medication we are taking might be a source of danger to ourselves, to other road users and the property of others? Driving is a complex skill and requires mental alertness, clear vision, physical coordination and the ability to react appropriately, which can be affected by changes in our physical, emotional and mental condition. Most of us are aware of the dangers of driving under the influence of alcohol or illicit drugs, but certain types of medication produce effects that impair our ability to drive a vehicle safely. Perception - needed for glare resistance, dark and light adaptation, and dynamic visual acuity. The reactions caused by certain types of medication may include nausea, drowsiness, blurred vision, inability to think clearly, reduced coordination and diminished motor or judgment skills and can, therefore, impair your ability to drive. These medications include over-the-counter medication as well as scheduled medication, prescribed by the doctor. Many medications - particularly those that affect the central nervous system - can impair your ability to drive, for example, muscle relaxants, sedatives and tranquillizers, anticonvulsants, older generation antidepressants, such as tricyclics and central nervous stimulants. It remains in the body for several hours and will probably affect driving skills even on the next morning. Over-the-counter medications containing diphenhydramine, brompheniramine, or chlorpheniramine, such as those for allergies (antihistamines) are especially known to cause drowsiness. One study in the Annals of Internal Medicine suggested that a standard dose of the antihistamine had a greater negative effect on driving “coherence” than alcohol. Driving coherence is the ability to match the speed of the vehicle ahead to avoid accidents. This study also suggested that antihistamines and alcohol had similar effects on steering ability and the likelihood of crossing into another lane. Herbal remedies that interact with prescription or over-the-counter medications as well as medications administered to the eye, which can produce heightened light sensitivity, should also be avoided when driving. The aforementioned is not a comprehensive list, therefore it is important to ask your doctor or pharmacist if the medication you are taking, whether over-the-counter or prescription medicine, may affect your driving or mental alertness. Valuable information regarding the side effects of a particular medicinal product can also be obtained by reading the package insert, or leaflet inside the package. New medicines, in many of the categories as mentioned above, have been developed to treat the same conditions, but which do not produce the same side-effects as the older generation medicines. Care should be taken to inform your doctor or pharmacist if you will be driving, operating heavy machinery or performing a task which will require you to be mentally alert and awake. 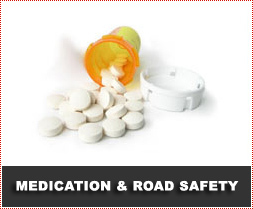 If the medication you are taking affects your driving, stop driving immediately. Do not stop taking your medicine, but seek advice from your doctor or pharmacist. Your doctor may be able to adjust the dose or the timing of doses and add an exercise or nutrition program to lessen the need for medicine or change the medication to one that has fewer side effects. The responsiveness of individuals to medication may vary considerably and a single individual may respond differently to medication at different times during the course of treatment. The length of use, tolerance, overall health, age, metabolism, individual sensitivity to the medication, age, interactions with other medications and other factors play a major role in an individual’s reaction to medication. This means that while a certain type of medicine or a specific strength or dose of medicine doesn’t make one person drowsy, it might affect another person much more severely and may cause extreme drowsiness and impair the person’s mental ability. In addition, the side-effects of medication may be more severe if you start a new medication, combining medication with other medication, take more than the prescribed dose, consume alcohol with your medication and in the elderly. If you have missed a dose of your prescribed medication, do not drive if your medical condition can make driving dangerous, e.g. if you have epilepsy or diabetes. Manage your medical conditions by taking your medication correctly, and discuss questions or problems with your pharmacist or doctor. Please be aware that this information is provided to supplement the care provided by your doctor or pharmacist. It is neither intended nor implied to be a substitute for professional medical advice. Call your healthcare provider immediately if you think you may have a medical emergency. Always seek the advice of your doctor or another qualified health provider prior to starting any new treatment or with any questions you may have regarding a medical condition.